Global medical device industry is driven by the innovative product launches, advancement in the devices and solution-oriented approach of the manufacturers towards product development. The medical device industry is growing at roust pace owing to the high demand for diagnostic and therapeutic devices treat acute and chronic diseases. There is constant increase in the number of cardiac, neurological, gastroenterological, and orthopaedic diseases among other diseases. Therefore, the image guided interventions market is growing at decent pace as such diseases requires interventional approach for effective treatment. Further, the demand is fuelled by significant improvement in the overall medical devices regulatory and formation of dedicated government bodies for medical device approval. Furthermore, substantial increase in the healthcare expenditure, has attracted more attention of investors for the image guided interventions market. Therefore, to sustain in the highly competitive market, the image guided interventions are gradually evolving as an advanced therapeutic tool in medical device industry with additional benefits, including high precision, live imaging, easy to handle and cost-effectiveness. Additional, the manufacturers in the image guided interventions market seeking relaxation in the legal requirements and regulations to abridge the R&D as well as the approval process for their products. Thus, providing companies to devote more time to solve complex challenges by innovating new components or technologies to attain better product efficiency. The purpose of this study is to gain a holistic view of the image guided interventions market in terms of various influencing factors, such as recent trends, regulatory requirements, and technological advancements of the market. The scope of this report constitutes a detailed study of the products associated with the global image guided interventions market, across different regions. The market has been segmented into ‘product type’, ‘modality’, ‘application’, ‘end-user’ and ‘regions’. The report presents the reader with an opportunity to unlock comprehensive insights with respect to the market and helps in forming well-informed strategic decisions. The research uncovers some of the substantial parameters that must be taken into consideration before entering into the market. This research report aims at answering various aspects of the global image guided interventions market with the help of the key factors driving the market, restraints and challenges that can possibly inhibit the overall market growth, and the current growth opportunities that are going to shape the future trajectory of the market expansion. The report includes an in-depth examination of the key players and recent developments taking place in this market. Moreover, the report includes chapters on market dynamics (market drivers, opportunities and challenges) and industry analysis as well. The research study highlights the factors governing the regulatory scenario and framework for a comprehensive understanding of the global image guided interventions market. Moreover, the study includes detailed product mapping with further sub-segmentation in various countries, and in each sub-segment the key market trends, list of the key companies, and the key strategies and developments, have been discussed. • How did the image guided interventions market evolve and what is its scope in the future? • What are the major market drivers, challenges and opportunities in the global image guided interventions devices market? • What are the key strategies that are being adopted by the key players to sustain in this market? • What key factors are influencing the end users in the industry? • How the image guided interventions systems are being regulated and enter the market? • How the supply chain works, and the product approval provided by various government organizations will affect the global image guided interventions market? • What was the market size of the leading segments and sub-segments of the global image guided interventions market in 2017? • What are the major benefits of the implementation of image guided interventions in different field of applications including cardiology, neurology, oncology, gastroenterology, orthopedics, ENT surgery and other applications? • Who are the key players in the global image guided interventions market and what are their contributions? The key players who have been contributing significantly to the image guided interventions market include Arthrex Inc., B. Braun Melsungen AG, Boston Scientific Corporation, C.R. Bard, Canon Inc, Dentsply Sirona Inc., Elekta AB, Fujifilm Holdings Corporation, GE Healthcare, Hitachi Ltd., Hologic Inc., IMRIS Inc., Koninklijke Philips N.V., KARL STORZ SE & Co. KG, Medtronic Plc, Olympus Corporation, Stryker Corporation, Siemens AG, Shimadzu Corporation, Terumo Corporation. 10.5 C. R. Bard, Inc. Image guided interventions consist of devices designed specifically to be utilized for performing precision based surgical interventions. The rising advent of the image guided intervention systems such as intraoperative MRI scanners, intraoperative CT scanners, intravascular intervention systems, intravascular ultrasound, fractional flow reserves, instantaneous wave-free ratio (iFR), endoscopes, fluoroscopy systems and other hybrid and digital devices has helped in the overall growth of the image guided interventions market. The high frequency in the product launches is the prime driving force that is expected to bolster the rapid market growth over the forecast period 2018-2028. Additionally, the strategies such as merger & acquisition, partnership, collaboration and expansion, along with recognitions such as awards and milestone achievement are likely to aid the deep penetration of such devices in emerging economies over the forecast period 2018-2028. The product type such as single and bi-plane system provide high resolution, 2D/3D real time data at high definition to ultra-high definition (4K) to provide accurate and precise information about the particular area to operate on. Such systems have helped in achieving high precision, efficiency and success rate in various interventional procedures. Image guided interventions are used for applications such as cardiology, neurology, oncology, gastroenterology, orthopedics, ENT surgery and various other applications (Urology, Cranial, Pain Management, Oral, Maxillofacial Surgery etc.) interventions. Cardiology has acquired the largest share in this market and oncology-based applications are likely to grow at high CAGR over the forecast period 2018-2028 owing to factors such as rising incidence of oncology cases and high rate of minimally invasive surgeries. The purpose of conducting this study is to gain a holistic view about the image guided interventions market in terms of factors such as recent trends and technological advancements occurring in this market. The scope of this study is based upon conducting a detailed analysis of the products associated with the global image guided interventions market, across the different regions. The global image guided interventions market is segment into five different parts such as by product type, by modality, by application, by end user, and by region. The global image guided interventions market is expected to reach $6,509.3 million by 2028. The demand for technologically advanced, high resolution, and affordable image guided interventional products owing to such factors the image guided interventions market is expected to witness the robustly paced growth over the forecast period 2018-2028. Moreover, the rapid growth of the market in the emerging economies such as India, Thailand, Malaysia, Sudan, Nigeria, Saudi Arabia, UAE, and Argentina among others, is expected to bolster the market growth over the forecast period (2018-2028). The single plane systems sub segment is expected to dominate the market and is attributed to grow at high pace in comparison to bi-plane systems. Further, the Intravascular Ultrasound, Fractional Flow Rate and instantaneous wave-free ratio (iFR) is the fastest growing sub-segment among the modality segment over the forecast period 2018-2028. Based on the region the global image guided interventions market is segmented into North America, Europe, Asia Pacific, Latin America, and Middle East & Africa. North America is the leading contributor to the global image guided interventions market and is estimated to have captured 33.4% of the global market in 2017. However, the Asia Pacific is expected to grow at a CAGR of 7.3% over the forecast period followed by North America. 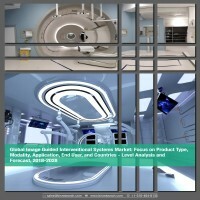 The key players who have been contributing significantly to the ambulatory devices market include GE Healthcare, Hitachi Ltd., Koninklijke Philips N.V., Fujifilm Holdings Corporation, Canon Inc., Olympus Corporation, Siemens AG, KARL STORZ GmbH & Co. KG, Stryker Corporation, Medtronic Plc, Shimadzu Corporation, Arthrex Inc., Koninklijke Philips N.V., B. Braun Melsungen AG, Hologic Inc., Becton, Dickinson and Company (C.R. Bard Inc.), Boston Scientific Corporation, Elekta AB, Sirona Dentsply Inc. and Terumo Corporation among others.